You’ve probably run into the jobs-to-be-done framework/theory. I did several years ago when I first stumbled into the Milkshake Study popularized by Clayton Christensen. I was immediately intrigued and had more questions than answers. I read up everything I could find and even worked alongside several JTBD thought leaders and practitioners including Bob Moesta, Chris Spiek, Tony Ulwick, Alan Klement, Des Traynor. A lot of their work influenced the development and still ongoing evolution of the Customer Forces Canvas and the Innovator’s Gift project. But even after all this research, two things continue to bother me. First, the commonly found definitions of a jtbd are circular, polymorphic, or purposely vague. Second, a lot of the case studies felt like neat magic tricks — obvious in hindsight, but hard to recreate with your own product. I want to attempt to tackle the definitions problem first. I believe starting with a clearer, more concise, simpler definition automatically moves us forward on the second issue. People don’t buy products, they hire them to get a job done. A job then is something people are trying to get done. What is that? A task, goal or objective a person is trying to accomplish or a problem they are trying to resolve. Tasks, goals, and problems are separate and distinct things. How can a job be three different things? A job to be done describes the progress people are trying to make. How do we scope progress? You’ll notice I left out the attributions on these definitions. This was intentional. Seasoned practitioners should have no problem identifying the sources and the curious should be able to easily look them up. I left them out because my goal isn’t casting judgment (or creating needless controversy). A lot of overlapping pieces are already laid out in these definitions. I am simply trying to piece them together through deconstruction. 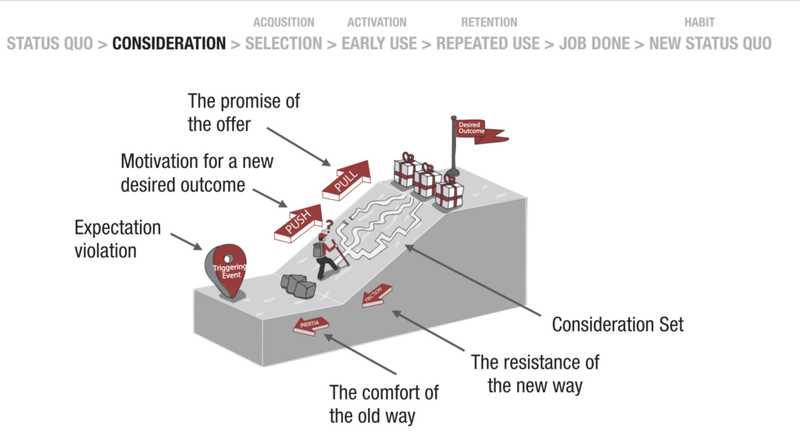 The definition below helped me see and practice jtbd more clearly. I’d love to hear your thoughts in the comments below. What then is a Job-to-be-done? A job to be done is the instantiation of an unmet need or want (in response to a trigger). Notes: One could argue that you could simplify this further: A job is an unmet need or want. This isn’t as actionable a definition. What differentiates a job from a job to be done is the time-boxed sense of urgency that a trigger creates towards fulfilling an unmet need or want. In other words, jobs could be aspirational nice to haves. Jobs-to-be-done, on the other hand, signal action. We encounter triggering events throughout the day which means we encounter jobs to be done throughout the day too. It’s 12:36 pm and my stomach is grumbling. I need to eat. It’s 7:36 pm and my stomach is grumbling and it’s my wife’s birthday. I want to take her to a fancy restaurant. Triggers are what define the context that shapes the job to be done. Notes: Progress doesn’t have to game-changing or aspirational. It could simply be taking me from being hungry to being fed. Having to find new solutions for every trigger we encounter would generate too much cognitive load so we rely on existing alternatives most of the times (like where to eat lunch). Notes: Some jtbd practitioners focus jtbd solely around the hiring and firing of products which implies buying or switching. I decouple a jtbd from a switch or a purchase. In other words, hiring doesn’t require switching. One could simply be reusing a previously purchased product to get a job done. A switching trigger is a special trigger that comes with an expectation violation. That’s when we realize that our existing alternative(s) isn’t good enough to get the job done. That’s also when we seek new and different solutions. an awareness event e.g. heard the new restaurant finally opened. Notes: Triggers instantiate jobs to be done which favor familiar solutions (existing alternatives). Switching triggers create expectation violations which open spaces for new solutions. When prompted to switch, customers often evaluate and trial multiple products in search of the one that best gets their job done. Getting hired, while an important first step, is only the first step. Unless you can quickly deliver value (the aha-moment) and then establish yourself as the new status quo (the habit-moment), you could easily find yourself on the firing block. Notes: Getting a job done isn’t just about acquisition. Activation and retention are where the rubber hits the road. The customer factory is a systems view of how customers move through your product funnel transitioning through 5 states of unaware visitors to passionate, happy customers. The customer forces describe the internal forces that make a customer go through between these state transitions. Needs are functional. Wants are emotional. Needs have utility. Wants have energy. Needs favor existing solutions. Wants favor new solutions. There is a place for both. We tend to focus on unmet needs in order to optimize existing solutions. We tend to focus on unmet wants in order to search for new solutions. Needs live in the solution context. Wants live in the bigger context. Notes: The most effective marketing triggers on our wants, not our needs. When Apple announces a new product, people have already made an emotional purchase. They then read the features to rationalize the purchase. Every product exists in multiple contexts: the solution context and the bigger context. Cameras existing in the product context. Photography is the bigger context. 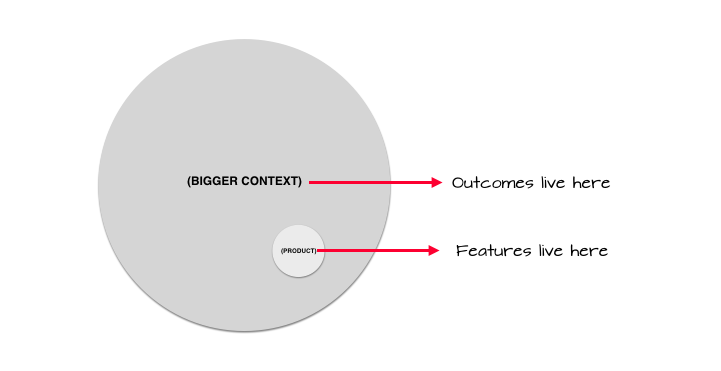 Lean Canvas exists in the product context. Innovation is the bigger context. Leveling up too many times on the bigger context can quickly get meta-physical quickly where you start questioning the meaning of life. But most innovators don’t level up at all. How do you find the bigger context? While the pursuit for better products should be outcome driven, not all outcomes are desirable. For example, you could build a stronger drill-bit that doesn’t break which delivers a better “hole in your wall”. But a “hole in your wall” is not the desirable outcome. Chasing desirable outcomes is how you move out of the solution space and into the bigger context. Why do people drill a hole in their wall? - If you are a drill manufacturer, you might be inclined to focus on building better drill bits that don’t break. - If you are 3M, you might build strong mounting tape that eliminates the need for drilling. - If you are Samsung, you might sell more flatscreen displays that replace artwork on walls. This is sometimes equated to disruptive innovation — doing old jobs with new solutions. When you’re moving really fast and constantly uncovering, prioritizing, and delivering on the unmet needs and wants of your customers, you’re not pursuing sustaining or disruptive innovation — it’s all continuous innovation. Doing this not only positions your business model for causing switch. More importantly, it positions your business model against switch. Delivering on the bigger context is how you cause switch and preventing switch is how you continue to stay relevant to your customers. 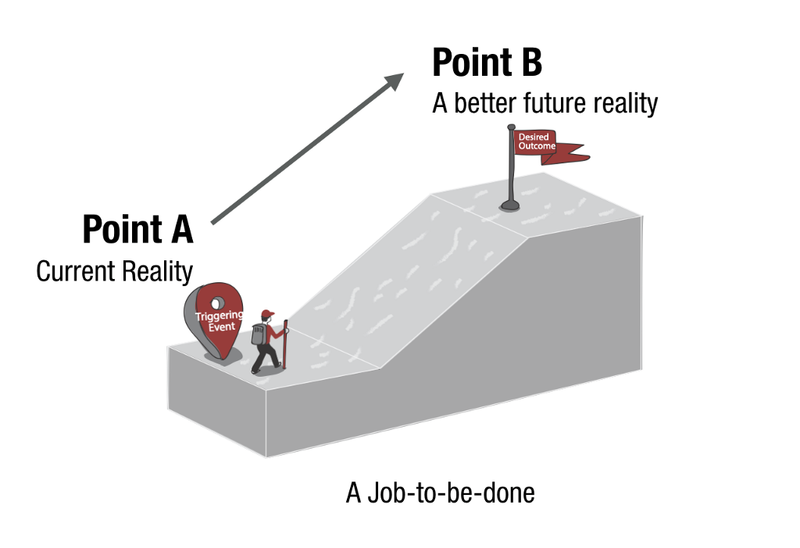 What is a Job-To-Be-Done (JTBD) was originally published in Love the Problem on Medium, where people are continuing the conversation by highlighting and responding to this story.